Pictures of Badacsony, Balaton, Hungary. Images & photos of Badacsony vineyards & Badacsony Wine Festival. Also buy stock photos & photo art prints. 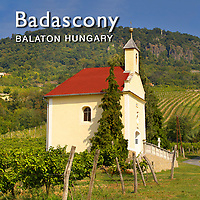 Badacsony is the name of a region on the north shore of Lake Balaton in western Hungary, and a town in that region. The entire area is recognized for its wine, with vineyards dating back to Roman times. The nearby basalt mountains are unique geological relics, and the habitat of many rare plants and animals. These monadnocks are peculiarly shaped results of volcanic activity, formed during the end Pannonia. Badacsony is the central part of the Badacsony wine region.